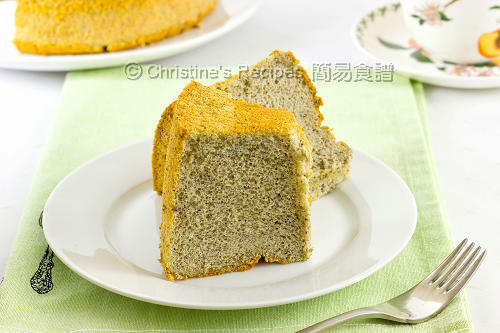 This black sesame chiffon cake has a gentle, pleasant fragrance with a very light and fluffy texture. Seriously, you’ll feel like not having enough even though you take half of the cake. That said, black sesame seeds can help reduce white hairs. This belief has been circulated in Chinese community for ages that can’t be proved anyway. We are certain is that black sesame seeds are really good for our health with high in many minerals, such as calcium, protein and antioxidants. As for cooking, black sesame seeds can enhance the flavour of many dishes, making them very popular in Southeast Asian cuisine. For baking a cake, we often use pure black sesame powder for convenience, as it's easily blended with other ingredients without any lumps left inside. 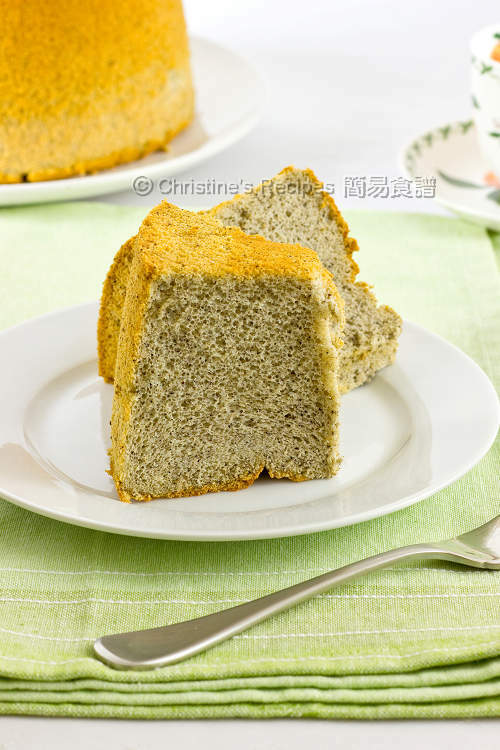 See the inside of this black sesame chiffon cake is very even and soft. 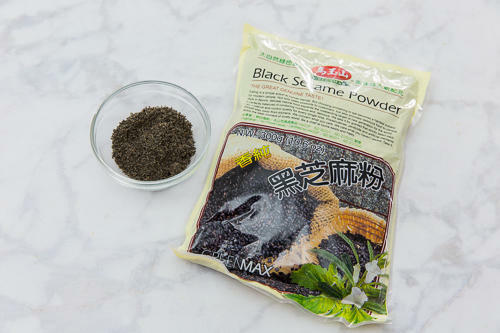 Both black sesame powder and black sesame seeds have a sweet and nutty flavour, yet have a slightly bitterness if using too much. The mild bitterness of the seeds could add a layer of flavour to balance the sweetness in desserts. They also can act as a spice in making cakes. The Black Sesame Powder that I used is unsweetened available at Amazon. 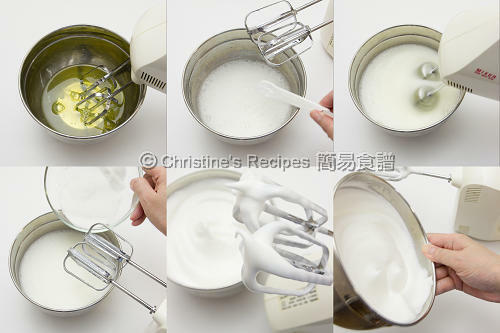 Make sure the mixing bowl is very clean, without any trace of oil, water or egg yolks. Sift the cake flour, baking powder and salt and mix well. Sift in the black sesame powder. Use a spoon to press through the sift if necessary. Combine well. Whisk the egg yolks with the 30 grams of caster sugar, until the sugar completely dissolves. Stir in the oil, bit by bit, until completely combined. Add the milk and stir well. 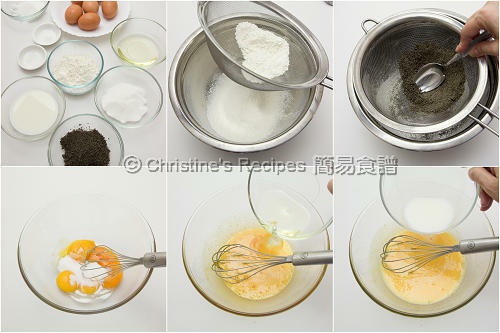 Sift the flour mixture into the egg yolk mixture, in three batches. Combine well. Pour the batter into the cake pan and bake in the preheated oven for about 35 to 40 minutes. After baking the first 15 minutes, if you find the cake surface gets browning, reduce heat to 160C / 320F. Continue to bake until cooked through. A needle comes out clean when inserted in the middle. Remove the cake from the oven. Invert the pan immediately on a wire rack (I found a flask that perfectly holds my cake pan inverted.) Let it cool completely. You might use any kind of vegetable oil without any strong fragrance. To get the best results, try to use a removable bottom cake pan. You don’t need to grease it. Otherwise the cake will shrink once it cools down. The cream of tartar can help stabilize the beaten egg whites. If you can't find any, you can replace it with 2 teaspoons of lemon juice. Is the 60g of caster the same as caster sugar? I am having a hard time finding caster sugar, do you have any recommendations to substitute it? I noticed a lot of your recipes (dessert wise) calls for it. Thank you for asking. Yes, this recipe yields for 60 grams + 30 grams of caster sugar to beat with egg whites and egg yolk respectively. Caster sugar is super fine sugar. It can be dissolved quickly and easily, good for beating egg whites. If you can't find any, you might process some regular sugar with an electric mixer to substitute. Wendy, I couldn't find caster sugar either, and then my friend told me a trick. Blend regular granulated sugar until it's really fine (keep checking that you don't accidentally go overboard and make powdered sugar). I usually blend up a large batch, and I think it substitutes great. I didn't know that black sesame combats white hair, learnt something new. Your bread looks perfectly baked as always. Someone told me that the black sesame needed to be rinsed and I tried that and it was a mess (sesame everywhere). How do you prep the sesame? I don't rinse the black sesame seeds when making this kind of cake, as they will absorb much moist and affect the end result. I just toast them in a small pan without adding any oil, then process them in a food processor into powder. Or simply get a packet of black sesame powder from Asian stores to save your energy. Thanks for the recipe. It came out really well. I can't find black sesame so I was wondering if I would make it with white sesame. Is there a difference? Would it not come out right since they are hulled? Black sesame has slightly bitterness. But the difference of their flavour is very little except the colour. Hi Christine, your cake looks really good. I want to try but I have been unsuccessful with chiffon cakes. I have tried the banana version and the plain version but neither worked. Once I take it out of the oven it starts to shrink, after a few minutes it shrinks even more. By the time it totally cool down, the size is almost even with the top of the pan. Once I remove it from the pan it shrink even more. I followed all the instructions, from beating the eggs whites and folding it in, then watch the baking time and temperature, but my cake still failed. I baked it in a non-stick pan. Do you think this makes all the difference? Don't ever use non-stick pan or even grease the pan when it comes to making this light and fluffy chiffon cake. The cake needs to stick to the sides of the pan to preventing from shrinking back. How can you remove the cake from the pan so nicely. The side of your cake always look so clean and perfect. When I remove mine from the pan, I always wait for the cake to be completely cool. Then, I run a small knife or metal spectula around the side but I alway tear the side of the cake and it doesn't look very nice. Can I suggest you do a video on how to remove chiffon cake from the pan? By the way, I love your blog and also bought your cookbook. Thank you for your love of my blog and support of my cookbook. I also used a sharp knife to run around the sides of the cake pan. Try to get a serrated knife, it'd be better and easier to remove the cake nicely. I used paper drinking cups to bake this recipe- cup-cake style... they came out amazing and I'm trying to figure out some sort of creamy custardy filling since I wouldn't want to ruin the pretty tops with icing. Love your blog a lot. Woo, creamy custard filling, sounds delicious. Thanks for sharing this recipe and the tips :)....Bookmarked! If I were to use a 23cm chiffon cake tin, how do I adjust the recipe? My cake shrinks a little bit (not much) even it is upside down. Is this normal? If the cake only shrinks a bit, it's normal. Thanks for sharing recip3. When I removed the cake after inverted it the bottom part of the cake was still moist and dense. Any idea when I did wrong ? You cake could be baked for a few minutes longer if you find it still moist. Every oven is very different, so adjust the baking time. Hi. I tried doing this chiffon cake twice but when I'm baking them in the oven there will be cracks on the top. May I know how to prevent this from happening again? Thanks. Some cracks on the top are normal, as long as they are not too serious. I want to try your recipe. Previously I have used a different Black Sesame Chiffon cake recipe and it used Black Sesame Paste. (I now have a big tube of it). Can I use the paste instead and add sesame seeds for extra crunch? If so, how much paste and sesame seeds would you recommend? Sorry, haven't tested this recipe with sesame paste. So can't tell. Hi Christine, I dont have a 8inch tin but I do have a 26cm round removable bottom tin. How do I adjust the recipe? Just multiply all the ingredients by 1.5 and you'll get there. 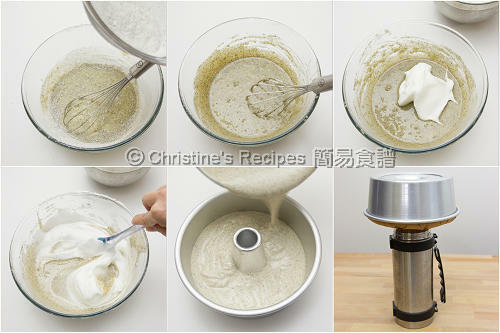 Hi Christine, can u tell me how to sieve the sesame powder , so coarse. I pressed the sesame powder through a fine sieve as shown in the above picture. It helps a lot. It all depends on how big your mould is. Try to find a recipe used a mould that is similar to the size of yours. Some brands of black sesame powder might be a bit coarse and not fine enough. You can either try another brand or press it through a fine sieve as the picture above. I used the green tea recipe to make coffee chiffon. I replace the green tea with instant coffee powder. I stir the 3 tablespoon coffee powder with 120ml hot HL milk. My cake turn out so soft, like waterly. Can u kindly advise where did i go wrong. If your sesame powder is too coarse, then mix in with the flour. Make sure they are mixed thoroughly, you still can make a cake successfully. What is the ratio for adjusting the ingredient according to the pan size I have? what size of baking pan are you using? Hi I have store bought sesame powder do I need to toast it before use? Hi ill be using store bought sesame powder. Is there a need to pre toast it as well? No need to toast the sesame powder. Normally, the store bought is pre-toasted before grinding. And the aroma is quite strong. Today was the first time I made a chiffon cake and it was wonderful, so light and fluffy like eating a cloud. Thanks for your amazing recipes. Love your blog. This is my first experience baking cake therefore I follow the recipes and methods very closely. Surprisingly, the cake turn out very nicely and tasty. My family loves it so much and requesting me to bake some more cake again. For those who don't like to eat too sweet, you may cut down the sugar level. Thanks Christine for sharing. I am using a 25cm tube pan. How should I adjust the ingredients? Also, can I apply the same ratio to your pandan chiffon cake recipe? Thanks! Can I substitute cake flour with other flour? You can use plain flour instead if you don't mind the texture will be a bit different. Hi can u advise how you arrive at the 1.27 and 1.25 for the different size chiffion pans? This recipe uses 20cm round cake pan. If you change to 25cm, supposed to make a cake with the same height, that's 1.25 times larger. I won't recommend to use silicon mould to bake this chiffon cake as a non-greased tin will help your cake "climb" higher. Your cake won't collapse easily once you remove it from the oven. If I want to bake it in cupcake size, how long do I needs to bake? I failed twice in normal chiffon cake size, so thought of trying out in smaller size version to see the end result. It depends on how deep your cup mould is. Try baking at 160C for 15 to 18 mins. Watch over when your cakes are in the oven. Can I still use this recipe for a 21cm chiffon pan? Will the 1cm make a drastic differences? Your cake might be a little bit shorter. You won't easily notice at all. I have a tube pan, a gift from a friend but I have no idea what is the size. When you say a tube pan is 20cm size, is that the inner diameter of the bottom or the top? The measurement is for the top inner diameter. The bottom diameter of my tube pan is a bit shorter than the top. As long as your tube pan is not too shallow, it will works perfectly too. May I ask why is there one more egg white than egg yolk? If I simply follow 6egg whites and 6egg yolks, what would be the difference in the end results? Also, how to determine the tube pan size? I got one that measures 26cm dia at the top of tin and 23cm dia at the bottom of tin, whay size is my pan and how to proportionate the ingredients to suit? Thanks so much for sharing and I cant wait to try out! The egg whites are for creating the fluffiness of the cake. Feel free to experiment what you like to twist. No need to worry about the bottom diameter as long as your pan is not too shallow. Thanks so much for your response Christine! I tried the exact recipe and the cake came out soft, moist and fluffy! I am so happy!! The sesame taste is very distinct too! My mom's favorite! Thanks so much for sharing the recipe. I have a question on the sesame powder preparation. If I grind the toasted sesame too long, they became pasty. If I don't grind them enough, alot will not be sieved through. I ended up grinding alot more sesame seeds to ensure I have the amount called for in the recipe. Is there any good tips to efficiently grind the sesame seeds? Glad that you liked this cake. I used store-bought black sesame powder. If you want to grind your own, it's hard to get it dry as black sesame seeds contain oil . After you grind the seeds long long enough, the oil inside will release and turn it into a paste. That's why I used the store-bought powder to make this cake. Hi, Christine, Tks for the recipe. My cake is soft & fluffy except for the big cracks on the top & when cold it's wrinkled also on top. Could it be due to my oven or mixing. Pls advise. The big cracks on top could be caused by too-high oven temperature. Every oven is very different. Try decreasing the oven temperature next time and see how it goes. Hi, Christine,my 2nd try, the cracks wasnt thst bad as the 1st time but there's still slight wrinkles. Why? Hi, Christine, its my 3rd time baking cake is soft & fluffy except for the big cracks on top. Why? Was the crack very big? If not too big, it's normal. All chiffon cakes will have little cracks on top. When served, the chiffon cake will be turned upside down. I cant post in the hk style sausage roll post but just happy to let u know that i had success with the sausage rolls too even without the sausage. Thanks again Christine! Congrats on your success. Thanks for letting me know. Is the measurement for all types of cake are the same , need to x 1.25 or 1.27 when I want it to be bigger size?How about the eggs volume? I used medium sized eggs, about 57 grams each. If you increase the size of your cake based on my recipe, you can use medium sized eggs too. Love your idea of icing the black sesame whipping cream on the cake. It must be very delicious. The water absorption of flour is different from brand to brand. Good to adjust the amount of milk. Congrats on your success. You're a good baker. hi there! looks great! can I check that we indeed use 5 yolks and not 6? and for egg whites we use 6 egg whites? That's right. 5 yolks and 6 egg whites. Will make the cake a bit more fluffy. Hi Christine, I tried making your cake, it tasted wonderful! However I couldn't really taste the black sesame. Can I add more black sesame powder the next time I make this? Thank you! Sure, you can add more black sesame powder. But be careful and don't add too much, just in case you don't want a bitter taste in your cake. Can I use a regular 8 inch round pan? I don't have a tube pan. Sure, you can use a regular 8 inch round pan instead. If using a tube pan, the middle of the cake won't shrink at all.